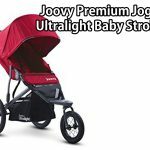 The Joovy Zoom 360 Ultralight Jogging Stroller is made of airplane aluminum so that its weight is maintained at a low 25.7 pounds enabling easy maneuverabiIity. The stroller has a straight through axle that enables it to run straighter and its pneumatic wheels allow for a more comfortable ride as it cushions the bumps that the stroller goes through while on the jog. The seats can be adjusted to multi-positions so that the child has greater visibility while on the jog. The parent organizer and in-seat mech compartments provide for baby supplies storage as well as cup holders for the caretaker. The swivel front wheel can be locked in a straight position for enable longer straight paths. Car seat adapters are available and can accommodate most strollers so that it is easier to transport the baby to and from destinations without taking him out of the stroller. Although the mesh material translates to a lighter scooter, the support for the baby is minimized as the weight of the baby is centered on a position that “catches” the baby in a corner of the scooter seat. Thus, movement is not much as the baby has his weight on the scooter seat. The “window” on the canopy is covered with plastic: this could provide irritation to the child as the sun’s reflection on the plastic cover may make the stroller area hot. The leash, although seemingly good, might actually be a hazard as the weight of the stroller and the baby could weigh down too much to be easily controlled most especially when going downhill. Although dimensions on the stroller were give, it does not actually say how big or how heavy a baby the stroller can comfortably ride. Because of this, 3 things could happen and that is1) that the stroller is too big for the baby, or 2)that the stroller is just the right size or 3) the stroller is too small for the baby. Of course, the we would not want the last to happen so it would be good knowledge for the buyer to know how big a child can be accommodated in the stroller. 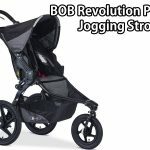 Based on our review, The Joovy Zoom 360 Ultralight Jogging Stroller could be a good pick to a jogging stroller as its weight does not burden the parent/caregiver at 25.7 pounds. The only concern is that with the simplified make of the stroller, it might be that the frame (although made of airplane aluminum) cannot sustain the weight of the baby in the stroller. The stroller’s bells and whistles could have been lessened and emphasis be put on the stability and durability of the stroller for the safety of the baby. This is more important than putting a multi-purpose organizer which could actually be just mesh bags that could carry some of the items for the baby. The stroller is to be used for jogging purposes though so there would not be too much need for many supplies that need to be carried while jogging with the child.